I'm totally psyched to share that I got some of these AMAZING purses from our friends, Chelsea and James of Grain Design. I been thinking about them since JOIN's Design Shoppe event last November....and FINALLY decided to just make a nice field trip over to their house on Bainbridge Island and pick them out myself! Their new line of purses, Sololá, is one of their awesome collaborative efforts to celebrate the artistry of Guatemalan women weavers in creating beautiful, one of a kind purses. 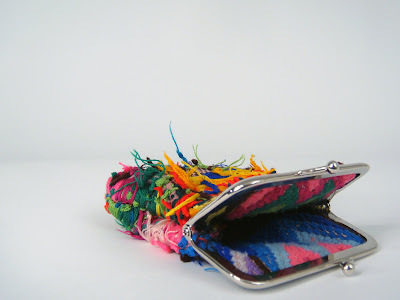 "Each purse upcycles a vintage huipile (traditional women's blouse woven on the backstrap loom) to create an individual statement. Turned inside-out, the huipiles are an explosion of color and handwork. 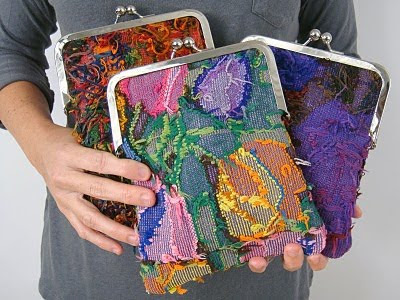 Each purse is assembled by Guatemalan artisans in Antigua from textiles sourced at the famous Chichicastenango Market." They're available in the Grain Shop! Also I'm excited to share that they'll be in the NY International Gift Fair starting Jan 31-Feb 4. Grain have been selected to to participate in the "A+: The Young Designers' Platform" section of Accent on Design along with 6 other designers. Both Chika and I will be going there to check out the NYIGF for the first time, and I'm totally excited to see some exciting new things, eat good food, and ride the stinky subway! Can't wait! L&G/Chikabird in Meg Mateo Illasco's Upcoming Book!! So around last August we briefly mentioned that Meg Mateo Illasco is working on some home decor book....but we forgot to mention that both Chika & I are also gonna be her book!! Ok, you totally want to hear the whole story, right? It all happened on lovely mid-July day in San Francisco when Chika & I traveled there to sell our goods at the Renegade Craft Fair...... But this particular day was more than any other craft show days we worked at. We had the pleasure to meet Meg for the first time that day when she was doing book signing for her book "Craft Inc."
I decided to get a copy of her book to have her autograph it since I'm a big fan of her work and I love the book and wanted to get it for a friend..but instead of acting like my normal self....I some how turned into a giant dork too shy to say much besides looking awkward and mumbling some less than significant words like "uh..your books is, uh, really cool...yeah...I like how you talk about business...and stuff...but for crafters....uh...that's pretty cool...yeah, totally." But of course, Meg was totally cool and SUPER friendly and just started asking me what I do...and as it turned out, Meg actually knew about our work!! AWESOME! On top of what was already an exciting interaction with Meg, things just escalated from there. Next thing I know she was in our booth checking out our stuff and chatting with us as if we're already friends (I love friends! )...and JUST when I was thinking that things can't get any awesome-er..Meg all of a sudden says to me "Hey, I'm working on a home decor book and is looking for people to submit some creative projects with a personal story, you guys wanna do it?" I looked at her like a deer in the headlight....then looked at Chika who also had the same look as me......I looked back at Meg and thought "Could this be real?! "....then realized I should provide some sort of response since she asked me a question....then finally I responded with great confidence "......yesssss?????" I totally thought it was too good to be true and thought maybe she just wanted to feel it out and so I was prepared that at some point we'll get an email from Meg saying that she found someone better with a better project or for whatever reason.....but everything fell into place....and we realized it was truly official when both Chika & I went back in SF 2 weeks after we met Meg, and found ourselves hanging out at Lisa Wong Jackson's lovely mid-century modern house doing a photo shoot with Meg, Lisa, Joy, and Joanna with Thayer Alllyson Gowdy the photographer for the book. Everything happened so fast I couldn't even register it all!!! The book will consist of of 25+ other well-known designers/artists/crafters each with a DIY home decor project that has their personal stories or memories. We were thrilled when Meg told us all the awesome people like Joy from Oh Joy!, Lauren & Derek of The Curiosity Shoppe, Lisa Congdon, Lisa of Good on Paper, Cathy Callahan of Cathy of California, Tootie of ReForm School and more were all contributing to the book! With a power group like that, I don't even have to know what sort of projects they are doing for me to just KNOW that this book will amazing! Here's some photos from the shoot. I want to live in Lisa's house! Lisa & Virginia (Meg's lovely assistant) in their matching striped shirt watching the photo shoot take place. For Chikabird, we made a Coat of Arms for the Dupe with all the graphic icons that represented us and then we wood burned them! Yum yum almond croissants from my FAVORITE SF bakery, Tartine!! I'm just more than excited the fact that not only will this be our FIRST time getting published in a book...it's gonna be in a book by Meg along with an amazing group of people that we've always found inspiring, too! There's just too much awesomeness all around! Can't stand it! The real book is plan to launch this early fall! I got to go see the Alexander Calder exhibit the other day at the Seattle Art Museum. 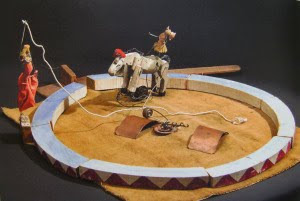 Besides seeing his beautiful mobiles from small to large in person, I was most delighted to see a video of the Le Cirque puppet performance during his years in Paris using all the little handmade figures and props made with mostly found materials. I was totally entertained to see how he manipulates each charming figures and re-creates a circus performance that's more than impressive and entertaining than seeing the real thing! 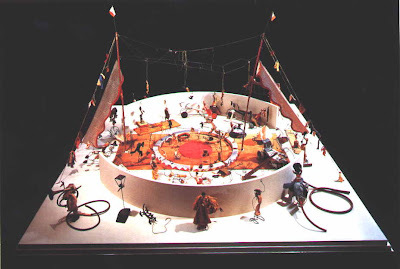 The perfectly orchestrated circus is made up of numerous elements of kinetically activated wire figures and animals, live sound effects, mini-stage props, and Calder himself performing in front of a live audience. 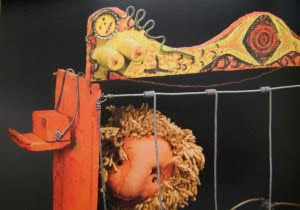 There's a great mix of really impressive well-engineered performances of Calder using wire figures doing trapeze to some occasional humorous act of when Calder throws couple of peanuts on the floor by the circus lion as a signal that it pooped. Who would have thought that lion pooping can be so delightful?! 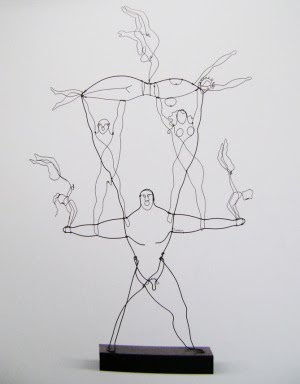 But Calder pulled it off. This is a 2 part video of his Le Cirque performance below... ( it's much better to see it at the museum on a big projection) But you can get a rough idea of Calder's sense of playfulness and how much pride he takes while doing the whole performance...just don't get creeped out by the way he laughs and talks....but hey, when you're Calder, you can get away with that and it's a-ok.
Mega Doily on Craft Magzine! If you're not sick of this yet....Here's Mega Doily featured on Craft Magazine! Woo Hoo! 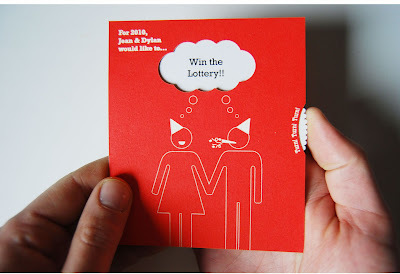 Happy New Year From L&G! We're looking forward to the new year and hope everyone will have an awesome 2010!